Greatest Blessings call me Mom | DATES Poster | 8x10 Digital Download Printable | Print it on Kraft Paper! 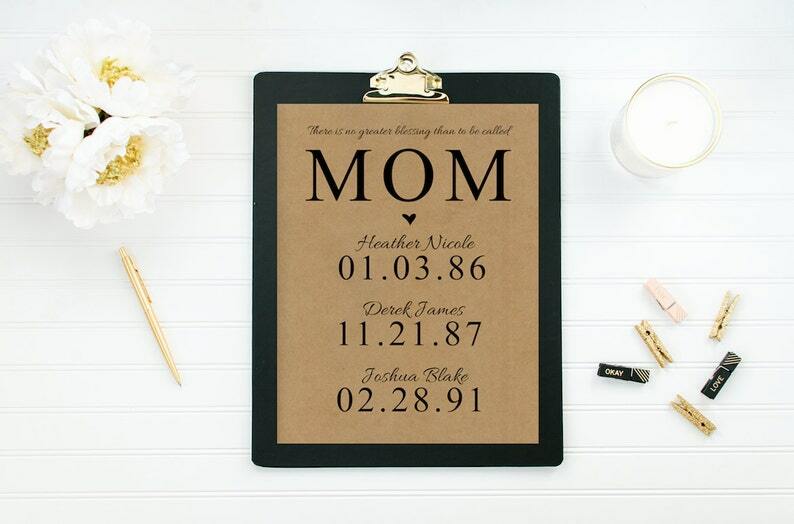 Greatest Blessings call me Mom | DATES | 8x10 Digital Download Printable | Print it on Kraft Paper! When you order this poster please include your dates in the Note to Seller section. *This printable requires you to purchase Kraft paper to print on. This is an 8"x10" digital download printable only. No item will be shipped. Please note that since this is a printable - colors may vary depending on computer & type of printer. Will take custom orders! Just leave me a note in the Notes section. Please allow 24-48 hours during business days to receive an email of your printable. An attachment will be sent to the email associated with your Etsy account. Set your print quality to the Maximum/Best setting. Use quality printer paper such as glossy presentation, brochure or photo. Make sure your printer is calibrated correctly and has enough colored ink. For best quality, if you are printing larger than 8x10 we recommend you send to a professional print shop for printing. Dates Poster 8x10 | The First Day, The Yes Day, The Best Day| Digital Download Printable | Print it on Kraft Paper | Custom Order! Share the Love | 8x10 Digital Download Printable | Social Wedding Poster | Hashtag # Custom Order | Social Icons | Print it on Kraft Paper! Dates Poster 8x10 | The First Day, The Yes Day, The Best Day | The Days We'll Never Forget | Digital Download Printable | Custom Order! Share the Love | 8x10 Digital Download Printable | Social Wedding Poster | Hashtag # Custom Order | Social Icons | Chalkboard Background! Latitude, Longitude, Coordinates | 8x10 Digital Download Printable | Kraft Paper Printable | Family Name & Home Town | Print on Kraft Paper! Latitude, Longitude, Coordinates | 8x10 Digital Download Printable | Custom Order | Family Name | Home Town | Choose your background! Perfect background for my laptop! Love it! Great shop to work with! Helped me design a custom print and the turn around was very quick! Payment is due at time of purchase. For custom orders you can message us in advance to see if we can custom design your order. Our items are digital download files. Since these are printables, colors may vary depending on computer and type of printer. We will do our best to fulfill any custom colors you request. However, we do not issue refunds for color discrepancies upon printing. For best quality we recommend you send your digital files to a professional print shop. Please allow 24-48 hours during the week of business to receive an email of your custom printable. You will either receive an instant digital download or custom files will be sent to the email associated with your Etsy account. - Set your print quality to the Maximum/Best setting. - Use quality printer paper such as glossy presentation, brochure or photo. - Make sure your printer is calibrated correctly and has enough colored ink. - For best quality we recommend you send to a professional print shop for printing. 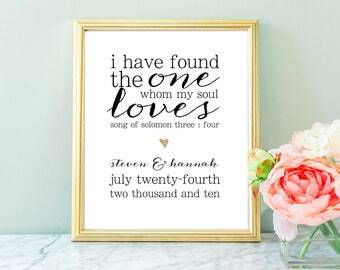 Song of Solomon 3:4 | Digital Download 8x10 Poster | Wedding Date Printable | I have found the one whom my soul loves | Custom Order! Family 8x10 Poster | Subway Art | Digital Download Printable | Love Each Other | Be Kind | Laugh | Simplify | Choose your background! University of Tennessee Poster Printable 8x10 | Big T Volunteers | Includes 1 Printable Instant Digital Download | Custom Order Available!